Your elderly cat’s just not the same. She howls at night, her once-perfect litter box habits are far from perfect now, and she seems to forget where things are. Could you be living with a senile cat? Recent research suggests that maybe you are. Senility in cats may be more common than we think. Writing for the Journal of Small Animal Practice, veterinarian Danielle Gunn-Moore says more than half of cats over age 15 show signs of senility. When her team member, veterinarian Kelly Moffat, studied 154 elderly cats, she found that 28 percent between the ages of 11 and 14 had at least one brain-linked behavior problem associated with aging. 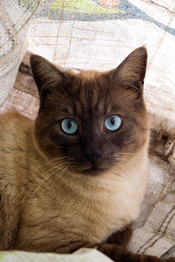 In cats 15 or older, more than 50 percent had behavior issues linked to the brain and old age. In her article, Gunn-Moore says the cause of senility in cats is unknown, but decreased blood flow to the brain and chronic free radical damage are most likely the culprits. Like the brains of humans suffering from Alzheimer’s, researchers have found altered proteins within the nerve cells of the brains of elderly cats and deposits of protein plaques outside the nerve cells. Cats, like humans who suffer from senility, become forgetful and can seem disoriented. A senile cat might get “stuck” in corners or between pieces of furniture, be unable to find the litter box that has been in the same location for years or forget to use it. Some might ask for food, forgetting that they’ve just eaten, and some seem to forget how to eat. Loud or unusual vocalizations, especially at night. Staying awake all night and sleeping all day. Sleeping more than usual is also a warning sign. Not recognizing human or animal family members. Some veterinarians suggest treating senile cats with L-Deprenyl (brand name Anipryl), a drug used to treat senility in dogs. Side effects are uncommon but can include vomiting, diarrhea, restlessness or lethargy, appetite loss and itchy skin. But Gunn-Moore says you can also use supplements to improve cognition. Among them: fish oil, vitamins E and C, L-carnitine, coenzyme Q10, phosphatidylserine and selenium. If you add supplements, check with a holistic vet first, and add them one at a time so you can see how your cat reacts to one before starting another. Like everyone, a senile cat can benefit from some mental exercise and environmental enrichment. Leave some blinds and curtains open so your cat can see outside, and put bird feeders and birdbaths near some windows. Play with your cat at least once a day, and think about taking her outside for supervised outings or on a harness and leash. The ever-changing world of outdoors will keep her mentally alert. Even just quiet companionship will provide some stimulation and mental exercise. Living with a senile cat takes flexibility, accommodation and love. Being willing to put litter boxes in several locations around your house will help if she can’t always remember where her box is. And taking her food to her when she forgets where her dishes are will encourage her to eat. To get her attention, try moving the dish around or tapping on it with your fingers. Cats who become disoriented and confused often do better when confined to a relatively small space, like one floor of the house or just a few rooms. Use baby gates to create your cat’s new space so she can see what’s going on in the rest of the house and won’t feel isolated. If she sleeps all day and is agitated and howls at night, try waking her up a few times during the day. That might change her sleep patterns. And leaving a radio on, providing night lights, leaving some blinds open so she can see outside and making sure she has some food to nibble during the night could all keep her occupied and quiet while you sleep. Living with a senile cat can be sad and frustrating. But with some flexibility and lots of love, the two of you will continue to enjoy her golden years together.